The quality of drinking water can change with time and become contaminated with harmful bacteria. 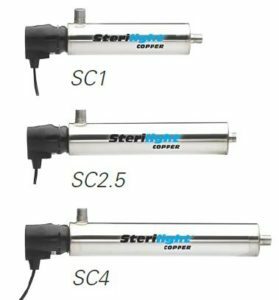 The Sterilight Silver™ system is a reliable, economical and chemical-free way to safeguard drinking water in any residential application. The Sterilight Silver™ system has been designed and tested to ensure quality drinking water is at everyone’s finger tips. The Silver series comes with basic option or a monitored option where the quality of the UV is monitored with a sensor to ensure optimum performance. • Equipped to inactivate chlorine-resistant parasites such as Cryptosporidium and Giardia, harmful bacteria like E.Coli and viruses not visible to the naked eye. 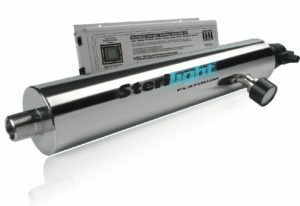 • Specially designed and tested Sterilume™-EX lamps provide consistent and reliable ultraviolet output over the entire life of the lamp (9000 hours) to ensure continuous purification. • The system is easy to maintain and service. • The ultraviolet lamp can be changed without interrupting the water flow. • The Silver™ ICE power supply visually displays the remaining lamp life and will go into alarm if the lamp fails to notify the homeowner. Monitored systems also have the ability to read the percentage of UV output. • Monitored systems have an optional solenoid valve which will stop the flow of water through the chamber should any changes in the UV performance falls below a safe level.